Just a day after the country and the world had its attention captured by a bizarre looking, intense “meteor” lighting up the sky over Michigan, the state south of Michigan, Indiana is having its own similiar experience. What might make the Michigan event even stranger is the fact that an unexplainable influx of white, Arctic Snowy owls is currently hitting Detroit: ever heard of an owl as an omen or kind of a bad sign? If you research “what does an owl mean” or something like that you’ll find new agey, positive leaning articles about the owl, but I feel like it’s kind of an ominous sign. Countless Indiana residents are reporting that they witnessed a flash in the sky just before midnight, at about 11:45 pm a couple days ago, Wednesday in the center of Indiana. Police departments in the Eastern direction of the major metropolis Indianapolis, including sheriff’s deputies in Henry County, Rush, Shelby, and Morristown reported seeing the “bright blue green flash” in the direction of the northeast. A bright blue green flash was witnessed by Officers in Shelby, Rush & Henry Co at approximately 11:50 pm on 1/17/18. Our Officer witnessed the light to the NE of Town. At this time we have not receiving any reports of power outages, may have been a meteor, aka: shooting star. A man named Bryan Bunton shared video captured from his home security system. Another person tweeted footage from security cameras west of Marion that show the flash of light on a whopping 9 screens. The light was so bright, it cast a defined shadow across a yard in New Palestine. Anyone in #Indy see a flash outside??? It was soooo bright. Lit up the sky green for a second. Even people in neighboring states saw the potential meteor, including people from Toledo, Ohio, and Chicago, Illinois. After the lights in the sky last night over Michigan definitely saw a large #meteor tonight. I’m west of Chicago was looking south east. People in Cincinnati Kentucky and Indiana saw same. 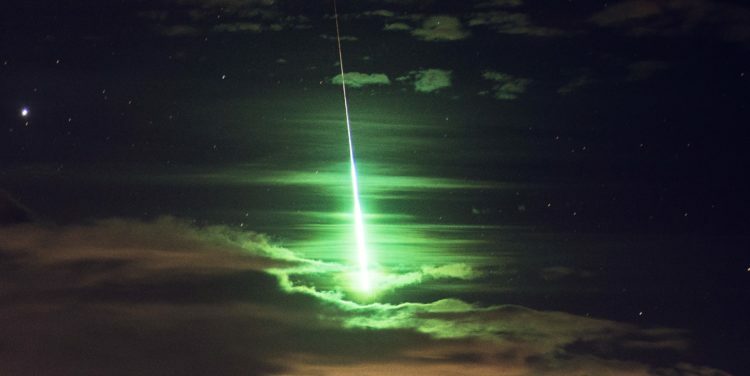 So the flash of light had a green tinge to it: has anyone heard of Green Fireballs, and their connection to the military industrial complex? “Green fireballs” were a phenomena reported as long as several decades ago, when military industrial complex activity and weapons tests that created “green fireballs” took place. In the 1940’s, green fireballs were spotted for what might be the first time in recent history in the Southwestern United States, blazing the sky in New Mexico in the exact era of time where the Southwestern desert saw the testing of nuclear weapons, biological weapons, and all kinds of other things. Fritz Zwicky, an astrophysicist with California Institute of Technology who also worked for Aerojet as Director of Research, obtained payload space in a V-2 rocket to eject small Army rifle grenades at a high altitude, creating weaponized, artificial “meteors” to strike a target. It was noted that jets of copper or iron particles would be visible as “meteor like trails,” and copper of course turns green when it is burned. That’s right: they literally tried to weaponize meteors. Did they succeed? What is this?